With a long history of conquest, disease, innovation and social reform, there’s more to London cartography than Harry Beck’s Tube Map. 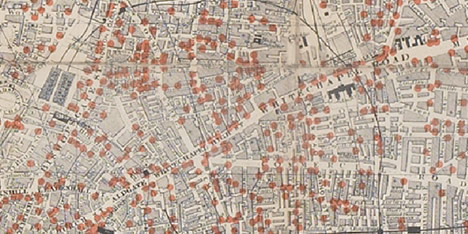 When over 500 people died of a cholera outbreak in Soho, London in 1854, John Snow mapped and identified patterns in the outbreak, clustered around the public water pump on Broad Street. This provided the evidence needed to affirm that the disease was spread through contaminated water, and not through the air, as many had thought. Read more at: 1854 Broad Street Cholera Outbreak on Wikipedia. 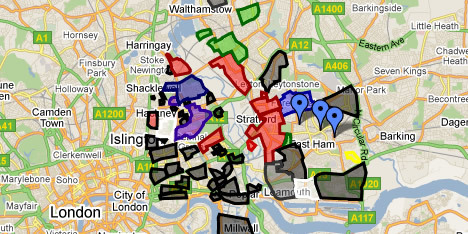 According to the London Street Gangs website, over 15,000 people in Greater London belong to one of 200+ gangs. This excellent community-based website offers a huge amount of research and news, including maps of claimed territories. When the claim was made in the late 1800s that 25% of Londoners lived in abject poverty, Charles Booth criticised the figure as an exaggeration. He set out to study the truth, investigating a wide range of social indicators and often living with working-class families for weeks at a time. His team of investigators also included Beatrice Potter, who would later found the London School of Economics and New Statesman magazine. Booth and his team found that the number had actually been under-estimated, and as much as 35% of all Londoners lived in poverty. The classification system used on the maps is interesting in itself, for the lack of modern political correctness in the wording: for the lowest class, ‘semi-criminal’, “their only luxury is drink”, whereas the middle-class are blessed with “much intelligence”. 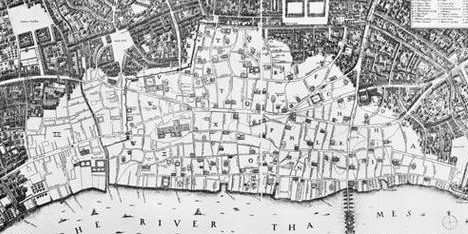 In 1666, the Great Fire of London ravaged 436 acres and over 13,000 homes. After the fire, the king directed Wenceslaus Holler to survey the extent of the damage. Within months, and with the help of a team of surveyors, the plans were drawn in March 1667. 5. The Modern Plague of London: Pubs! 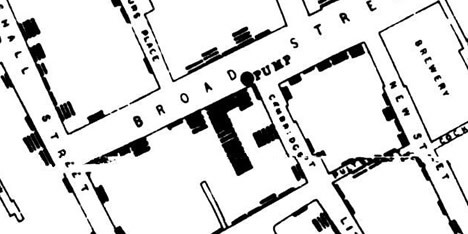 Who better to publish a handy map of Victorian London public houses than the Temperance Society! 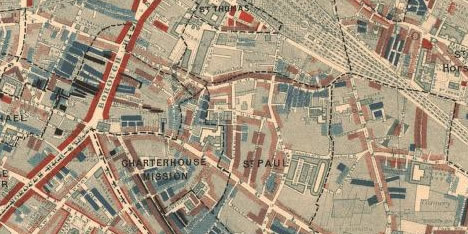 This 1886 map borrows from John Snow’s earlier work on mapping cholera in an attempt to depict alcohol as a spreading disease.